Our good friend Jimmy called me up and requested that I make a cake for his wife's birthday. The only two ideas he gave me were that she's a huge Georgia Tech fan, and she LOVES dragonflies. I searched Cake Central's website and saw a cake with these beautiful dragonflies with shimmery wings made of GELATIN, of all things! Long story short, I tried to make the gelatin wings, but they didn't really come together very well. Maybe some other time. So, I kept looking for other ideas. 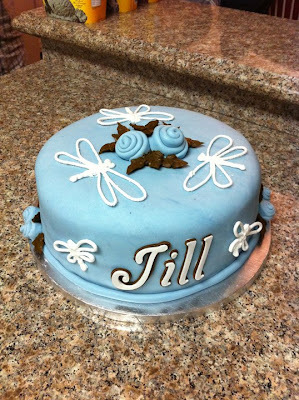 Found another design on CC that featured dragonflies made of royal icing. Easy enough, right? I made approximately 30 dragonflies for this cake the night before (so they would dry). They were soooooooooooooooo delicately fragile, too fragile for words. If I would pick one up, it would break. If I would move one, it would break. If I would touch one, it would break! If I would breathe on one, it would break! If I would so much as LOOK at one, it would break! OK, so maybe I'm being "slightly dramatic," but I kid you NOT, I was down to 3 or 4 dragonflies from the night before. I made some more, bringing my total number of dragonflies to around 50, and hoping against all hope that they would be dry enough before the party that they wouldn't break. Well, I ended up with a whopping 7 dragonflies attached to the finished cake. One of which I broke when I picked up the cake on my way out the door! Luckily I was able to fix it on the spot, and we had a wonderful celebration. I would also like to mention that this was my first successful attempt at using my Cricut Cake machine for the lettering on this cake. I learned a few things from trial and error, and got really lucky this time. I think it looks pretty nice, don't you? Sam's GIGANTIC CAKE OF AWESOMENESS!! !